Epic theatre (German: episches Theater) is a theatrical movement arising in the early to mid-20th century from the theories and practice of a number of theatre practitioners who responded to the political climate of the time through the creation of a new political theatre. These practitioners included Erwin Piscator, Vladimir Mayakovsky, Vsevolod Meyerhold and, most famously, Bertolt Brecht. The term "epic theatre" comes from Erwin Piscator who coined it during his first year as director of Berlin's Volksbühne (1924—1927). Piscator aimed to encourage playwrights to address issues related to "contemporary existence." This new subject matter would then be staged by means of documentary effects, audience interaction, and strategies to cultivate an objective response. The epic form describes both a type of written drama and a methodological approach to the production of plays: "Its qualities of clear description and reporting and its use of choruses and projections as a means of commentary earned it the name 'epic'." Epic theatre incorporates a mode of acting that utilises what Brecht calls gestus. One of Brecht's most-important aesthetic innovations prioritised function over the sterile opposition between form and content. Brecht discussed the priorities and approach of epic theatre in his work "A Short Organum for the Theatre". Although many of the concepts and practices involved in Brechtian epic theatre had been around for years, even centuries, Brecht unified them, developed the approach, and popularised it. Near the end of his career, Brecht preferred the term "dialectical theatre" to describe the kind of theatre he pioneered. From his later perspective, the term "epic theatre" had become too formal a concept to be of use anymore. According to Manfred Wekwerth, one of Brecht's directors at the Berliner Ensemble at the time, the term refers to the "'dialecticising' of events" that this approach to theatre-making produces. Epic theatre is distinct from other forms of theatre, particularly the early naturalistic approach and later "psychological realism" developed by Konstantin Stanislavski. Like Stanislavski, Brecht disliked the shallow spectacle, manipulative plots, and heightened emotion of melodrama; but where Stanislavski attempted to engender real human behaviour in acting through the techniques of Stanislavski's system and to absorb the audience completely in the fictional world of the play, Brecht saw this type of theatre as escapist. Brecht's own social and political focus was distinct, too, from surrealism and the Theatre of Cruelty, as developed in the writings and dramaturgy of Antonin Artaud, who sought to affect audiences viscerally, psychologically, physically, and irrationally. While both produced 'shock' in the audience, epic theatre practices would also include a subsequent moment of understanding and comprehension. One of the most important techniques Brecht developed to perform epic theatre is the Verfremdungseffekt, or the "estrangement effect." The purpose of this technique was to make the audience feel detached from the action of the play, so they do not become immersed in the fictional reality of the stage or become overly empathetic of the character. Flooding the theatre with bright lights (not just the stage), having actors play multiple characters, having actors also rearrange the set in full view of the audience and "breaking the fourth wall" by speaking to the audience are all ways he used to achieve the Verfremdungseffekt. Brecht, too, advised treating each element of a play independently, like a music hall turn that is able to stand on its own. Common production techniques in epic theatre include a simplified, non-realistic scenic design offset against a selective realism in costuming and props, as well as announcements or visual captions that interrupt and summarize the action. 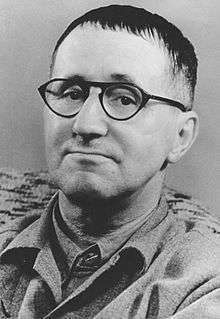 Brecht used comedy to distance his audiences from the depicted events and was heavily influenced by musicals and fairground performers, putting music and song in his plays. Acting in epic theatre requires actors to play characters believably without convincing either the audience or themselves that they have "become" the characters. Actors frequently address the audience directly out of character ("breaking the fourth wall") and play multiple roles. Brecht thought it was important that the choices the characters made were explicit, and tried to develop a style of acting wherein it was evident that the characters were choosing one action over another. For example, a character could say, "I could have stayed at home, but instead I went to the shops." This he called "fixing the Not / But element." ↑ Quoted by Willett (1964) 282. Brecht, Bertolt. 1949. "A Short Organum for the Theatre". Trans. John Willett. In Brecht (1964, 179-205). Genet, Jean. 1966. Letters to Roger Blin. In Reflections on the Theatre and Other Writings. Trans. Richard Seaver. London: Faber, 1972. 7–60. ISBN 0-571-09104-0. Innes, Christopher. 1972. Erwin Piscator's Political Theatre: The Development of Modern German Drama. New edition. Cambridge: Cambridge UP, 1977. ISBN 0-521-29196-8. Squiers, Anthony. 2014. An Introduction to the Social and Political Philosophy of Bertolt Brecht: Revolution and Aesthetics. Amsterdam: Rodopi. ISBN 978-9042038998. Wiles, Timothy. 1980. The Theatre Event. Chicago: Chicago University Press. ISBN 0-226-89801-6. Willett, John. 1964. Editorial notes. In Brecht on Theatre: The Development of an Aesthetic, by Bertolt Brecht. London: Methuen. ISBN 0-413-38800-X. New York: Hill and Wang. ISBN 0-8090-3100-0. Epic Theatre – University of Southern Queensland Artsworx Resources on The Good Woman of Setzuan.